AT ATVTRACKS.NET WE ARE THE LARGEST STOCKING CAMSO/CAMOPLAST DEALER IN THE WORLD! Also Bercomac snow blowers and ATV/UTV Parts and Accessories! At ATV Tracks.net we are the foremost experts on rubber track systems for ATV’s, UTV’s, SxS’s, and Off-road motorcycles. ATV Tracks.net has the best sales deals with prices too low to advertise. 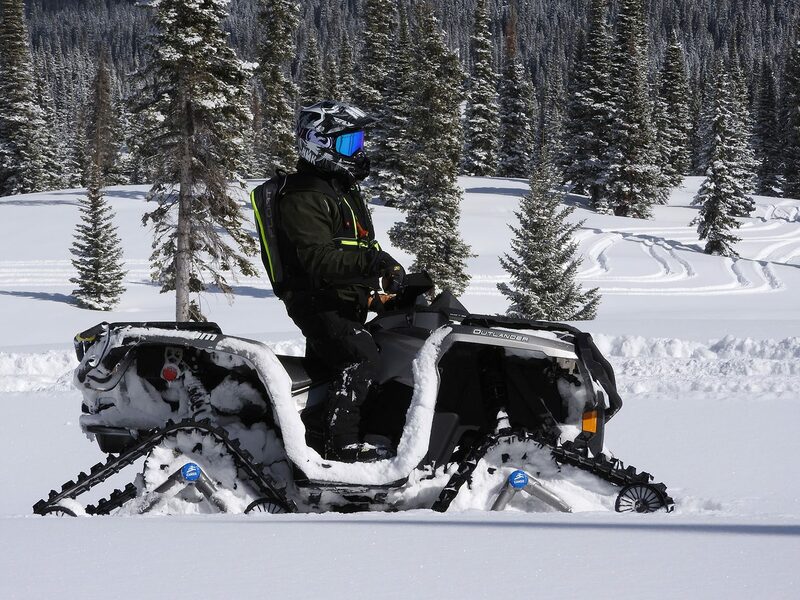 We carry a full line of parts and accessories for your ATV, UTV or Snow Bike. Use our expertise to learn more about our great products from Camso, Kimpex, Bercomac and many more. Click below on the product line you are interested in learning more about. You rely on your all-terrain vehicle (ATV) or side-by-side (SxS) to do more, to get you where you need to go, or to help get that job done. No matter how rugged your machine is, deep snow, serious mud, and swampy terrain can sometimes be too much for your wheels to handle. Equip your ATV or SxS with track systems to get reliable year-round mobility. 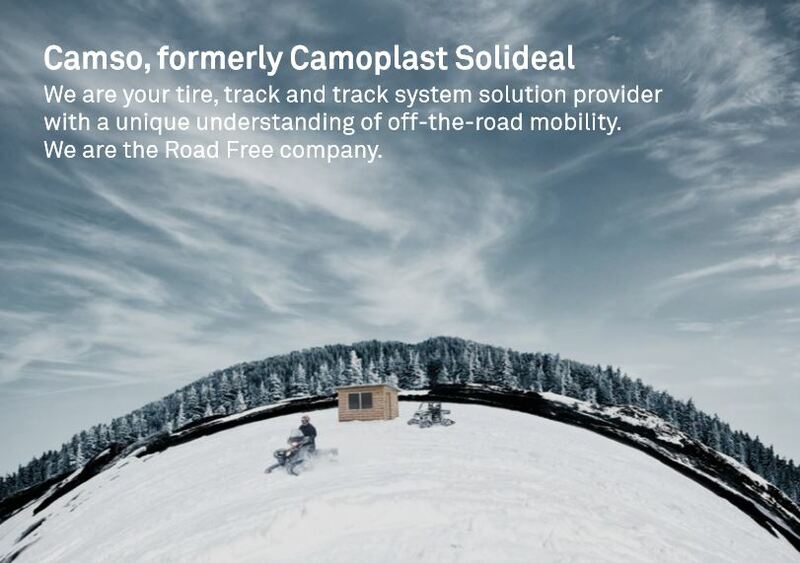 With their tracks and treads specifically designed for ATVs and SxS vehicles, Camso Track Systems offer advanced traction and hauling power. With this kind of traction, it’s hard to get stuck even with the heaviest of loads. Enjoy outstanding stability and easy steering; thanks to the track’s rigid frame, anti-rotation features, specialized design, and wider, longer wheelbase. 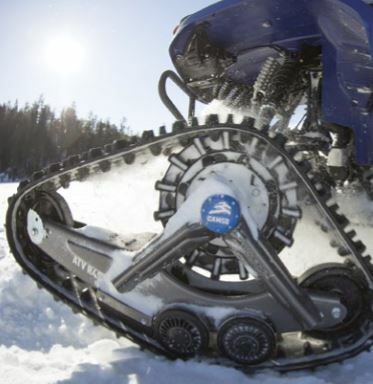 Front-mounted ATV and SxS tracks feature Camso’s exclusive flex-track design. With flexible sides and a slight curve toward the inside, they provide a more comfortable ride than traditional flat tracks. The front tracks provides a stable handling with their flexible sides, and the rear flat tracks offer more traction and flotation. Performance is a product of power, balance and precision. 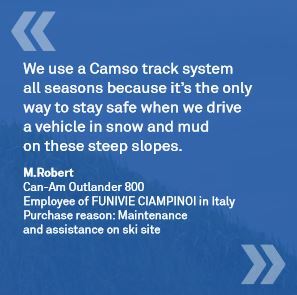 That’s why Camso tailors track systems individually to match your engine and machine. The size of the drive sprockets we provide in your track kit are specifically engineered and adapted to your specific vehicle. Your tracks will deliver maximum flotation and traction without sacrificing performance. 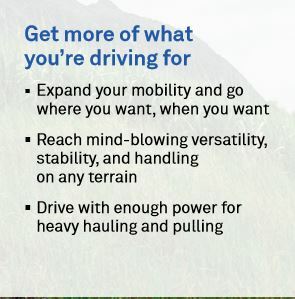 Get more of what you’re driving for! No matter how rugged your side-by-side or all-terrain vehicle is, deep snow, serious mud, and swampy terrain can sometimes be too much for your wheels to handle. Where wheels just sink, Camso track systems will keep you moving by distributing your vehicle’s weight over a greater surface area. Push your vehicle’s performance to the next level with a four-season track system that will never let you down. You rely on your all-terrain vehicle (ATV) or side-by-side (SxS) to go where you want to go and get the job done. 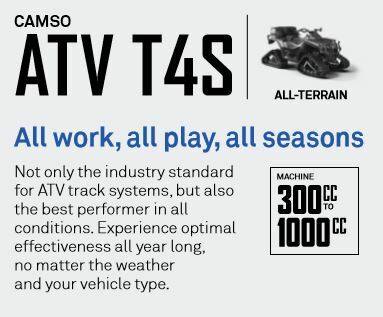 Now you can take your vehicle’s performance to the next level with a four-season track system that will never let you down. 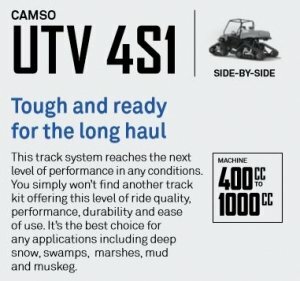 The Camso UTV 4S1 side-by-side track system, launched earlier summer in 2016 is specifically engineered for the toughest conditions. This new track system reaches the next level of performance and surpasses the needs of side-by-side vehicles owners by ensuring an unmatched ride, and more. You simply won’t find any other track kit offering this level of ride quality, performance and durability. 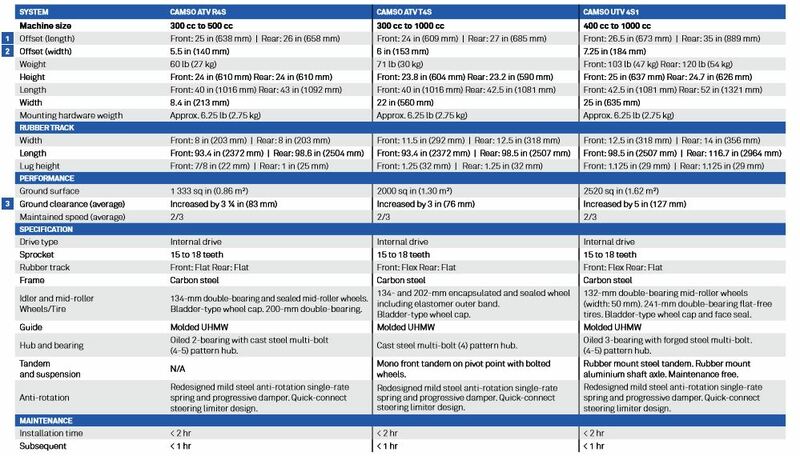 The Camso UTV 4S1, like wheels, only better!!! With our tracks and treads specifically designed for ATVs and SxS vehicles, it’s hard to get stuck even with the heaviest of loads. Whats the difference between Camso and ALL Other competitors? 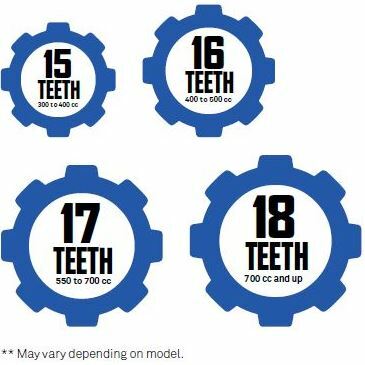 Drive sprockets geared to your machine. Camso tailors track systems individually to match your engine and machine. The size of the drive sprockets we provide in your track kit are specifically engineered and adapted to your specific vehicle. They maintain maximum speed and improve low-end power.